Common Hawthorn (Crataegus monogyna) is a tough native hedge plant with glossy dark green, deeply lobed foliage that is a foil to sprays of single white flowers with red anthers in May. The flowers are followed by small red haws that are popular with birds. In autumn, leaves turn yellow and bronze before falling. Hawthorn produces a bushy hedge with sharp thorns on its branches which makes a good intruder deterrent and safe haven for wildlife. Often used alone or as part of native hedging mixes, it benefits from being tolerant of coastal, exposed, polluted and damp sites. 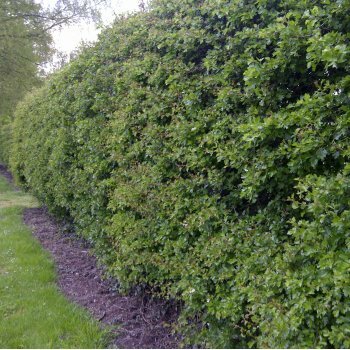 Please note delivery charge is included with our hedging pack deals.